Canadian Fabricating & Welding recently wrote an article about MakLoc’s usage of ERP software on the shop floor to help optimize work flow! We pride ourselves on always looking for new ways to help maximize efficiencies and minimize excess waste. By implementing digital systems for our shop floor to interact with the Global Shop Solutions Read More.. The MakLoc Buildings IT department is continually looking for advanced technologies that incorporate state of the art metal building technologies in our business. We strive to be a leader in the manufacturing industry in terms of innovation so we can deliver the highest turnkey solutions to our customers. Our IT capabilities keep all employees in Read More.. The summer thunderstorms rolling through Alberta raise concerns around lightning strikes and metal roofing. A recent bulletin posted in Design and Build with Metal addressed misconceptions about the association between metal roofs and lightning. It was interesting to note that metal roofs do not attract lightning, nor do metal roofs protect buildings against it. As Read More..
2018 has brought continued pricing escalation for raw steel products affecting our metal buildings, metal building products, and structural steel skids. The current uncertainty in the world market will most likely prevail throughout the year. To help mitigate this cost and schedule impact to our customers, MakLoc Buildings Inc. has hedged and invested in an Read More.. 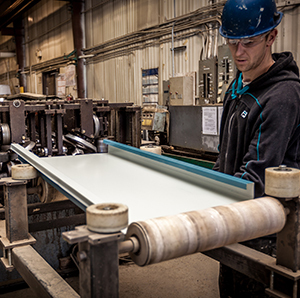 The drafting team at MakLoc Buildings Inc. has engaged in the development of a new in-house cutlist program, for both rigid frame and self frame buildings. The program has undergone testing and will be rolled out this summer. The team prides itself in the ongoing development of drawings. We strive to become the leaders of Read More..
MakLoc Buildings Inc. is proud to announce that they have begun implementation of their first Kaizen initiative aimed at reducing waste and improving our processes. “Shipping a Complete Building” was identified as the area for improvement, no small task as it involves multiple facets of the organization including sales and estimating, drafting and engineering, project Read More..
MakLoc Buildings Inc. pride ourselves with developing and maintaining relationships with employees leading to long term successful careers with opportunity for personal growth throughout the organization. This also provides MakLoc with a wealth of internal metal building systems knowledge that can be easily downloaded to new employees in key positions. We have recently had the Read More..
At MakLoc Buildings and Construction we believe one of the most valuable parts of personal protective equipment is eye protection. Due to the nature of our business we are constantly exposed to potential hazards that contribute to eye injuries. Some common workplace eye injuries within the construction, manufacturing and industrial settings can include the following: Read More..
At MakLoc we are committed to health and safety as an opportunity to look and “listen” to our processes and ensure our systems are operating effectively. The surest methods of preventing noise-induce hearing loss (NIHL) is to eliminate the source, or to reduce noise at the source by engineering methods. However, in certain situations, these Read More..
At MakLoc we are committed to continuously looking into our EHS culture and how to improve year over year. Over the last several months we have collected input from all levels of the organization to evaluate our current culture and how to improve. We believe that rather than referring to our safety policy and program, Read More..